Twenty five years on and Keith Wright still finds his name prefaced with the words “Skol Cup hero”. But today he told Alan Stubbs’ players that if they can lift the Scottish Cup on Saturday they’ll be remembered forever. And, he insisted, he wouldn’t be envious in the slightest if they did end the Easter Road club’s agonising 114 year wait for the trophy, like any Hibs fan he’ll simply enjoy what would be the party of his life. 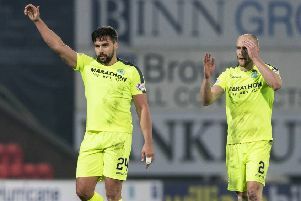 However, former striker says Hibs can only do so if they banish from their minds the bitter disappointment of losing out on promotion for a second season and instead concentrate on going for glory. He admitted: “It’s a rather unusual situation. The Cup final is always the big showcase game, the last match of the season and the week building up towards Hampden is one in which the excitement and anticipation grows by the day. ”We all know what the ideal scenario was going to be, promotion and the chance to win the Scottish Cup. Promotion, sadly, has gone and while it’s horrible to think of Hibs having another season in the Championship they can still end the season on a real positive by winning the cup. “But they can’t go feeling sorry for themselves, Rangers certainly won’t have any sympathy for them. From the moment they stepped back through the doors of East Mains, however tough an ask it might have been, they had to forget all about what happened at Falkirk. It’s done and dusted, gone. “Now they have to focus 100 per cent on getting this monkey off our back. I had six years as a Hibs player and loved it, We reached the one League Cup final and won it and lost another one. It’s crazy, but all these years down the line I’m still called ‘Skol Cup hero Keith Wright’, but the players who win the Scottish Cup for this club will be absolute legends. Hundreds of Hibs players have, of course, tried and failed for a century and more but Wright insisted that he, for one, won’t feel even a twinge of envy if they were to succeed where he and others were found wanting. Wright knows plenty about turning a negative into a positive, arriving at Easter Road as the club’s then record signing from Dundee only a matter weeks after the threat of extinction had been averted, the lifelong Hibs fan then scoring in every round of the League Cup in what became known as the team that wouldn’t die. “Although I didn’t join until the August,” remembered Wright, “I knew everything that had happened the year and months before. But I’d never had a thought about the worry the other guys had been through until you were in the changing room listening to them talking about how their jobs, their livelihoods were at stake. “But there was a real determination to get together, to grab the chance and to make sure we weren’t going to let the fans down. The club had been saved, it was about turning the disappointment of what had happened into a success, to give the supporters something to cheer about. Likewise, Wright believes the 21,000 Hibs fans who will be at Hampden on Saturday can play their part by putting aside the deep hurt and anger they feel about events of the past few days and showing they are right behind Stubbs and his players. And the fact it is Rangers, he believes, will allow Hibs and their fans a measure of optimism even if the Championship winners will go into the final as firm favourites. Hibs can boast an impressive record against Premiership opposition having dumped Hearts, holders Inverness Caley and Dundee United out of the competition – not to mention doing the same to Aberdeen, United and St Johnstone in making the final of the League Cup a couple of months ago. While Hibs were embroiled in those play-off matches, Mark Warburton’s players have, in stark contrast, been idle since their final league game against St Mirren at the beginning of the month, their only action a closed doors friendly against a Tottenham Hotspur XI. Wright, an SFA football development officer with Midlothian Council, also believes the fact Rangers appeared to “take their foot off the pedal”, not winning any of their last four matches – although they did beat Old Firm rivals Celtic on penalties to reach the final a week after winning the Petrofac Cup – could count against the Glasgow outfit. He said: “There will be a bit of a buzz about the Rangers fans this week, particularly with the talk of bringing in players like Joey Barton and Niko Kranjcar. They’ll be thinking it’s just a matter of turning up to win it. Then we’ve been reading Kenny Miller saying they don’t want to be the team that loses a Scottish Cup final to Hibs. “To me, though, that should just make the Hibs players all the more determined. One of my best memories of the Skol Cup was being written off ahead of our semi-final against Rangers. We were up against a very good Rangers team but we were really fired up – although you should be for every game. We didn’t have any failures in our team that night, we all played to our full potential and that’s what will be needed on Saturday. “I think the fact Rangers have had such a break could work in Hibs’ favour. They looked to have switched off with the league won and when you do that it’s very difficult to switch back on. Yes, they’ve had that friendly against Spurs but I wouldn’t imagine the players in that game would have been throwing themselves into 50/50 challenges and risking getting hurt before a cup final. “I think the first 20 minutes could be crucial, Hibs have been playing competitive high pressure matches, Rangers haven’t, so it’s important to get off to a good start and take advantage if they prove to be a wee bit rusty. To win the cup by beating Rangers would just make it all the sweeter.